Odisha's Peacock Man 'Panu Behera' Is No More & There's No One To Love & Take Care Of His Peacocks! Odisha’s Peacock Man ‘Panu Behera’ Is No More & There’s No One To Love & Take Care Of His Peacocks! After the super cyclone, three peacocks from Chandaka reserve forest had come to this place and since then Panu Behera has been taking care of them which resulted in the rise in their population in the area. A retired home guard of police dept, he had been taking care of our national bird for the last 30 years. 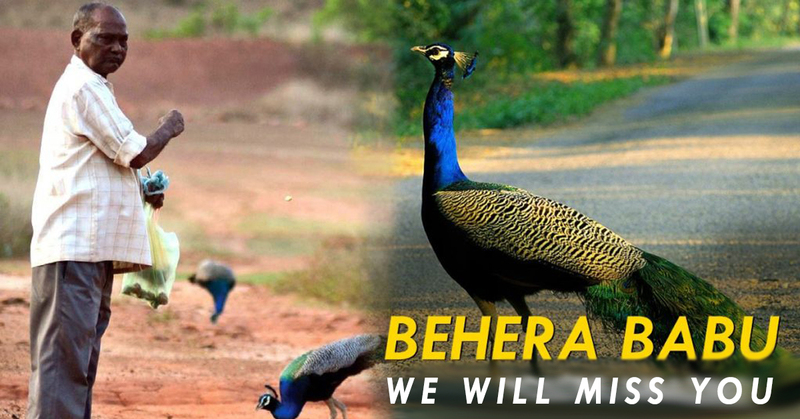 He lived near a village at Naraz in Cuttack feeding 40 to 50 peacocks on a daily basis out of his pension money. But now Panu Behara is no more. Panu Behera who is awaraded by President’s Medal for meritious service in 2007, had special bonding with over 60 peacocks that used to respond to his calls. Local villagers said that Panu Mausa used to feed the birds twice early in the morning and evening. But after his death there’s no one to look after the peacocks which includes 3 rare white peacocks. Couple of months ago when Odisha Shines published an article on Panu Behera, we got a lot of response and so many people wanted to meet him but unfortunately this sad news shocked everyone. As there’s no one to take care of these peacocks we can only hope that Naveen Patnaik govt. will come forward to rescue these peacocks and take care of them. As we have mentioned before ‘Panu Behera‘ who taught us that ‘Loving Animals Means Loving All Animals, Not Just The Ones We Share Our Homes With’. We Miss Those Days When News Channels Weren’t Bias & Anchors Were Not Shouting. Here’re The Top10 Anchors Of 90’s! Four Iconic & Inspirational People From Odisha Who’ll Receive Padma Shri Award! Odisha’s Top 6 Cities With Their Nick Names & We’re Looking For More! Top Decisions By Odisha Born CJI Dipak Misra, Which Makes Him No Less Than A Hero!